Are the Redbull cars light-years ahead? Has Adrian Newey finally found his sweet spot within the team? Is Christian Horner the happiest man in the paddock? Yes. Yes to all of the above. Five years after the birth of the Redbull Racing F1 Team, the team has come into their own. So much so that Webber was some 0.834 seconds faster than Hamilton in third. That is a gap rarely seen in qualifying. I applaud their attempt to cream the field, the very unique field this year made up of four World Champions: Jenson Button, Lewis Hamilton, Fernando Alonso, and Michael Schumacher. Speaking of Schumacher, the updates: new chassis, new air ducts.. have done well for him. For the first time this year, Michael has out-qualified his teammate Rosberg and that makes me feel good. The improvement of Schumacher is directly related to the popularity of Formula 1, in my mind. I would now like to direct your attention to a photograph from this weekends Qualifying session. It is one of the Ferrari cars and I do not understand it. I honestly thought the Ferrari was one of the better looking of cars on the grid this season.. until now. The team have been coming under pressure by several governing bodies and medical agencies stating that the previously used ‘barcode’ visual is subliminal messaging for Marlboro advertisement. If you ask me, that is exactly what I thought it was. However, Ferrari denied it and denied it until they could not take it. The result: a red square in a white border. That destroys the look of the car. A statement issued by the team said: “Together with Philip Morris International we have decided to modify the livery of our cars starting with the Barcelona Grand Prix. Together with Philip Morris (the company that owns and distributes Marlboro). 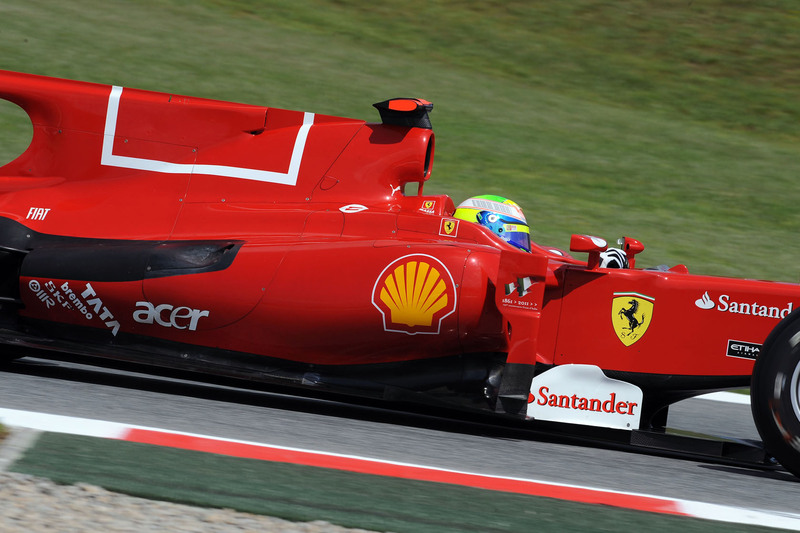 Ferrari met with Philip Morris to decide whether to remove the barcode or not. Doesn’t that mean that the barcode had something to do with Marlboro? Even when Montezemolo denied any such relation? I found that a little strange. Quali done, well done everyone in the team, we going away from other new teams, and catching Williams. Looking forward to race! Both Trulli and Kovalainen managed to clock a time faster than Virgin Racing and HRT and enjoyed around a 1 second gab between them. If you haven’t noticed, Burger King is in Formula 1 – a sponsor for BMW Sauber. They are improving with a 9th and 11th place for tomorrow’s race. The McLaren’s look menacing in 3rd and 5th but nothing will be able to shuffle the Redbull duo unless they face problems. My money is on Vettel.